during Game Seven of the 2011 NHL Stanley Cup Final at Rogers Arena on June 15, 2011 in Vancouver, British Columbia, Canada. (NHL.com) – Defenseman Dennis Seidenberg will sign a one-year, $1 million contract with the New York Islanders after the World Cup of Hockey 2016 ends, TSN reported Wednesday. Seidenberg, a native of Schwenningen, Germany, is a member of Team Europe, which is playing Team Canada in the World Cup final in Toronto. I remember back during the NHL lockout at the start of the 2012-2013 season Dennis Seidenberg was playing for the Mannheim Eagles of the DEL (Deutsche Eishockey Liga) over in Germany with his younger brother Yannick. It just so happens that a buddy of mine, after his cup of coffee in the NHL, was playing on that Mannheim team as well. 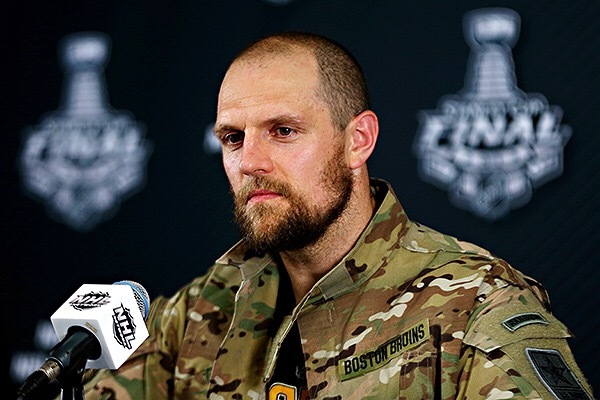 When he came back home he said one night Seidenberg, with his perfectly chiseled frame, had caught a guy going over the middle with his head down and it was the hardest hit he’d ever seen in his life. He absolutely thought the guy was dead. Six months later #44 would be back in Boston playing in the Stanley Cup Final again. As for today, this is a great deal for Seids. I’m really happy for him. Ottawa, along with 6 other teams, were reportedly in the mix for his services and opting for New York isn’t a bad gig for the aging defensemen. He’s going to be back in the locker room with ol’ pal Johnny Boychuk and hopefully continue the momentum he’s gained from a strong showing at the World Cup of Hockey. Although he hasn’t thrown any all-time hammer hits like he did once upon a time in the DEL he certainly has shown a lot of strength mixing it up and knocking guys off the puck the past few weeks. I still don’t mind the buyout the Bruins used on Seidenberg as he struggled last year and the kids on entry level deals need to play this time around. But I didn’t want to see his career end that way. Now he gets a chance to use that buyout as a motivator in his final kick at the can.